You might have seen him playing on the television and asked yourself, Who is Phil Ivey? 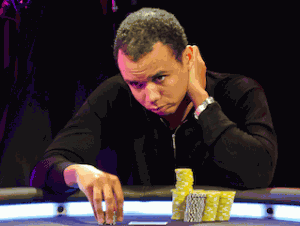 To put it simply, Phil Ivey is one of the great American professional poker players. Until he was three months old, Phil Ivey lived in Riverside, Californa and then his parents moved to Roselle, New Jersey. Ivey is known for being one of the most balanced poker players. Ivey has often been referred to as, The Tiger Woods Of Poker. He has received eight World Series of Poker Bracelets and one WPT title. In addition to winning eight World Series of Poker Bracelets, Ivey also holds the record for being the youngest to win eight bracelets at just 34. To give him even more merit, Ivey has been the fastest to accumulate eight bracelets because it only took him 10 years to do this. In the year 2002, Ivey tied for a four-way record between Phil Hellmuth Jr., Puggy Pearson and Ted Forrest. The tie was over having the most tournament wins in a year. Ivey was also the first person who beat Amarillo Slim heads up, at the final WSOP table. Phil Ivey helped to co-create the online poker site known as Full-Tilt Poker. In May of 2011, Ivey tried to sue them for a breach of contract, which numbered to around $150,000,000 in damages. Ivey later withdrew his lawsuit on June 30 for unknown reasons. Despite having legal trouble with poker sites, Phil has done exceptionally well with poker sites. Online poker stats shows that Ivey won a grand total of $1.99 million on Full Tilt in 2007. Ivey proceeded to win $7.34 million in 2008, $6.33 million in 2009 and $3 million in 2010. If you want to improve your game of poker, then studying an accomplished poker legend like Phil Ivey will certainly improve your poker playing skills. Each poker great has a unique style, and Phil Ivey’s style is one of the most balanced, well played styled in the world of poker.